Once the cornerstone of the Ura-Harajuku fashion scene, NIGO® and Jun “JONIO” Takahashi’s store NOWHERE has since become the stuff of legends. Although both the original store and its temporary second branch are long gone, the name continues to be used for events such as 2013’s “BAPELAND” exhibition; regardless of the actual store’s demise, the NOWHERE partnership remains alive and well in the minds of both of its originators. 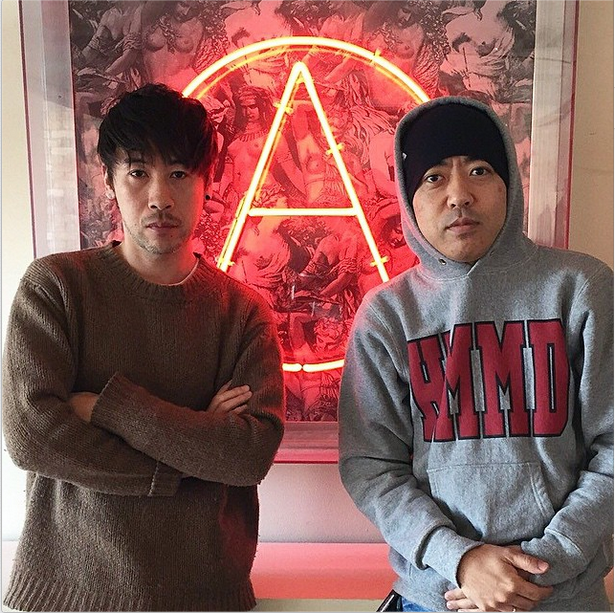 As NIGO® recently posted the above photo to his Instagram, captioned “Meeting with JONIO. New project coming next year,” one can only speculate at what could be on the horizon – a new clothing line, reopening NOWHERE again, a new exhibition of some sort, or a combination of any of these are all possibilities. NIGO® recently launched a collaborative exhibition based around a one-off clothing line with Tetsuya “Tet” Nishiyama, who was his replacement as head designer at *A BATHING APE® (the scene is incredibly incestuous), so perhaps a similar event with the man he’s had the longest-standing professional relationship with may be in the cards. The ongoing collaboration between iOS fashion app POKER FACE and NIGO®’s new-school pop group BILLIE IDLE® continues with a new photo set of the lovely First Summer Uika – available for purchase through the app – as well as a quick video look at the shooting of the first set (featured above). As with before, she’s dressed all in clothes from NIGO®’s Adidas Originals collection (still in stores, I’d like to note – I’ve purchased a few pieces from it myself), and I personally have my fingers crossed that future BILLIE IDLE® shoots might feature NIGO®’s HUMAN MADE line; however, it’s probably more realistic to assume that UT by Uniqlo (which NIGO®, that multi-talented man of mystery, is creative director for) will be featured before the less well-known brand. As an aside, I’ve never asked for comments before, but I feel it’s warranted here; do people want more fashion content or should Memories of Shibuya stick to the music? The ties between Shibuya-kei music and Ura-Harajuku fashion may not be as explicit as they were when NIGO®’s Ape Sounds label was regularly publishing Shibuya-kei artists and Cornelius dressed exclusively in NIGO®’s *A BATHING APE® line, but they do still continue – my only question is if people want to read about them. Rising from the ashes of BiS (Brand-new Idol Society), new group BILLIE IDLE® promises two things: firstly, a continuation of BiS’s iconoclastic antics, and secondly, an opportunity to hear more from their manager, A Bathing Ape founder and current HUMAN MADE owner NIGO®. NIGO® had previously directed the BiS video “nerve“, and one can only hope BILLIE IDLE® (that registered sign, just like the one after NIGO®, is essential to the name) will be better, musically – but the point of BiS was never really the actual music, was it? The former group was most notable for their antics – such as releasing a black metal single out of nowhere – and BILLIE IDLE® is continuing this proud tradition in their decision to launch an official fan club before they’ve had a single performance, released a single song, or really done much of anything in particular. I don’t know enough about Japanese idol groups to know if this is actually common, but at the very least we’ll be checking in with NIGO®, First Summer Uika and Nozomi Hirano’s new group as news comes up. Why not, eh?